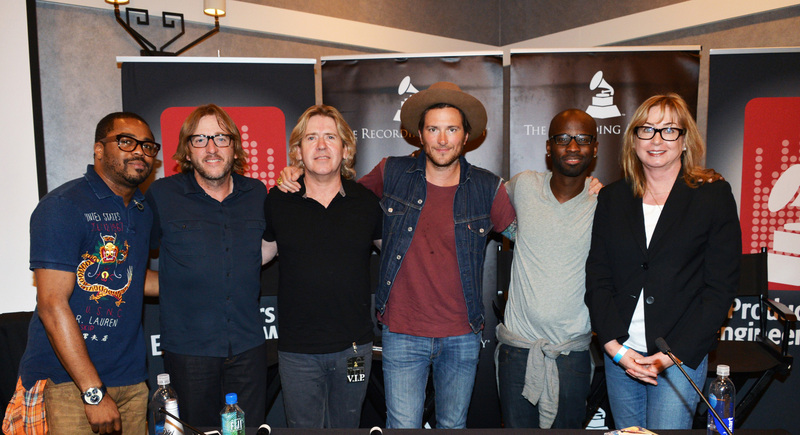 Pictured L-R: producers Justin "Just Blaze" Smith, Brendan O'Brien, Steve Lillywhite, Butch Walker and Bryan-Michael Cox; and P&E Wing Senior Executive Director Maureen Droney, at GRAMMY GPS: A Road Map For Today's Music Pro, held Sept. 8, 2012, in Atlanta. Photo Courtesy of The Recording Academy®/Wireimage.com © 2012. Photographed by: Rick Diamond. SANTA MONICA, Calif. (September 20, 2012) — On Saturday, Sept. 8, The Recording Academy® Atlanta Chapter, in association with the Producers & Engineers Wing®, held GRAMMY® GPS: A Road Map For Today's Music Pro at the W Hotel in the stylish Buckhead district of Atlanta. Nearly 300 musicians, students, producers, engineers and other music industry professionals assembled to attend multiple educational sessions which covered topics such as basic entertainment law and vocal health, as well as, for students, an introduction to GRAMMY U, internships, networking, and more. A highlight of the all-day conference was the Super Producer Panel with a stellar lineup featuring Bryan-Michael Cox (Mary J. Blige, Mariah Carey, Janet Jackson), Steve Lillywhite (Dave Matthews Band, the Pogues, U2), Brendan O'Brien (Bruce Springsteen, Rage Against The Machine, Pearl Jam), Justin "Just Blaze" Smith (Drake, Eminem, Jay-Z) and moderator Butch Walker (Pink, Katy Perry, Weezer). The group offered nonstop, lively opinions on topics including what defines a producer, how the industry has changed and how they are adapting, different aspects of the production process (business, sonic, artistic and aesthetic) and the increasingly important relationship between recordmakers and devoted fans. In a final summary of what it takes to succeed today, Walker offered, "You've just got to work harder to put more 'good' on your album." The day ended with a presentation of "Here There & Everywhere: My Life Recording The Music Of The Beatles" by legendary engineer Geoff Emerick (the Beatles' Revolver, Sgt. Pepper's Lonely Hearts Club Band, Magical Mystery Tour and Abbey Road, along with work for other key artists) and author Howard Massey. The duo took a delighted and appreciative audience on an audiovisual journey behind the scenes into the creative and technical processes of this remarkable engineer that led to some of the greatest music of the last 40 years. "We had an amazing assemblage of talent here today in Atlanta," stated P&E Wing Senior Executive Director Maureen Droney. "The producers and engineers who participated all showed the passion for their work that was the uniting theme of the entire day — they all recognize the realities of our changing industry and continue to seek to elevate their profession." Photo Caption: Pictured L-R: producers Justin "Just Blaze" Smith, Brendan O'Brien, Steve Lillywhite, Butch Walker and Bryan-Michael Cox; and P&E Wing Senior Executive Director Maureen Droney, at GRAMMY GPS: A Road Map For Today's Music Pro, held Sept. 8, 2012, in Atlanta. Photo Courtesy of The Recording Academy®/Wireimage.com © 2012. Photographed by: Rick Diamond.